At Papillon Press we consider ourselves artists, not just printers. Our designs focus on illustration, not typography. We don’t use stock imagery. We draw all our design by hand (in pen & ink). We don’t outsource any of our production process. We print it all on our handfed CP & Co. letterpress. We do it all in-house, ourselves. Rest assured that artistry and craftsmanship were the number one focus in the making of our letterpress goods. Chantal Bennett wears the hat of owner, illustrator, designer and presslady. She studied illustration at Parsons The New School of Design in NYC and illustrates books in her spare time. 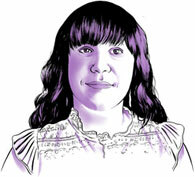 Her anachronistic passions include classic children’s turn-of-the-century illustration and basically anything vintage. 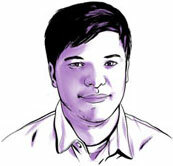 Joel Kimmel is an editorial illustrator who studied illustration at Sheridan College. His specialties include drawing portraits, Depression era imagery, relics of our industrial past and rural landscapes. His work has appeared in such publications as Wired, ESPN, the NY Times and the Royal Canadian Mint . He is also a big basketball fan. Peanut is the Papillon Press beagle mascot/lap warmer.